iPod data recovery software is a cost-effective utility that rescues deleted and missing movies, songs, photos, snaps, images files lost due to improper handling of iPod music device. 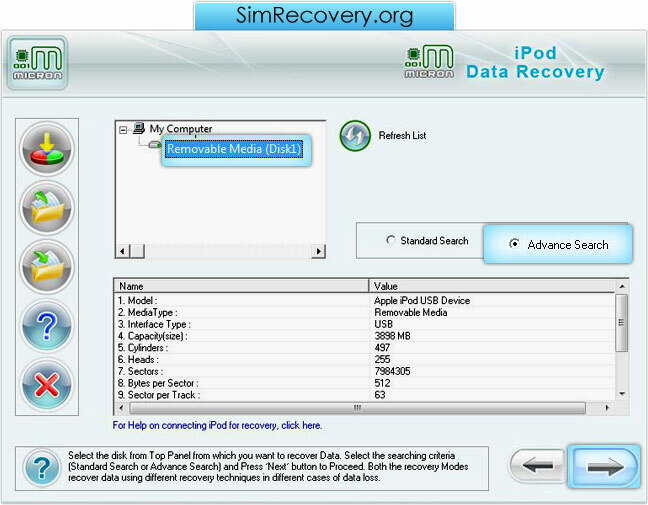 iPod recovery mode restores corrupted files from all types of Apple iPods such as iPod Nano, iPod Mini, iPod Shuffle, iPod Touch, iPod Classic (from first generation to next generation series) and recovers all other previously existing data in iPod device memory. Brands of iPod Music Device - Support all type of Apple iPod models including iPod Nano, iPod Shuffle, iPod Mini, iPod Classic, iPod Touch etc. Supported File Formats - aac, mp3, wav, aiff, mpeg4, jpeg, gif, bmp, tiff etc. User Interface - User-friendly, easy to use GUI interface to restore lost or deleted files and folders.